Picture this memory – It’s a sunny September morning; you can smell the tasty bacon that your mother is preparing so lovingly. You abandon your video game, race to the kitchen, kiss your parents on the cheek and plunge into the kitchen stool, just in time for breakfast. Once done, you help your mother wash up before heading off to your local supplier for brand new vinyl shutters. It’s now 30 years later and it feels like yesterday that you were sharing a meal with your parents. You and your family moved back to your childhood home a few weeks ago. Maybe you are just moving into a new home and there they are some old vinyl shutters. It’s been an adjustment moving homes, especially with renovations. Despite some new furniture and aluminium shutters, you couldn’t come to remove the vinyl shutters, even though it was old and the paint was peeling. Don’t throw away precious comforts. Instead, repair and reuse them so they can last for many more years. How do you do this? Keep on reading to find out. With so many choices, ensure that you choose your desired paint colour. It’s crucial that the paint is safe to use on your vinyl shutters, as well as making sure your shutters are paintable. Check which screws your vinyl shutters use before starting your DIY project. After this, you’ll need to mark and label where each shutter is fitted, this is the most critical part, as each shutter is drilled into a part of the house differently. Do not skip this part, as it will be impossible for you to match the holes up yourself if you lose track of which window they came from. To assist you in this, draw up a diagram of this part of your home. Allow the wood to dry for a few hours or better yet, overnight. Paint the screw heads to match the vinyl shutters. Once completed, obtain a 1 or 1’5 angled brush and begin painting. Remember, when painting with a faux wood grain, that you paint with the wooden grain, so you don’t end up with a mess. Allow this to dry for seven days or more. If it’s not completely dry, it could gain scratches while it’s being hung up. It’s not just enjoyable, but it’s also environmentally friendly. Make your mark this year, by transforming your old vinyl shutters into a work of art. 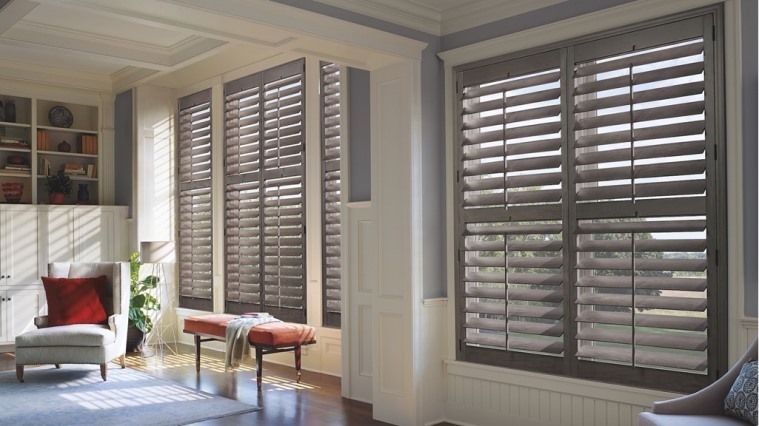 They will be perfectly suited to your new shutters you install as the paint can be matched. This entry was posted in Shutters and tagged vinyl shutters.